Distinguish Yourself as a Supply Chain Expert! As worldwide competition increases, operations and supply chain professionals hold the key to achieving business objectives. APICS CSCP training can help your company enhance, communicate, and implement critical supply chain strategies that maximize profits and growth. With the APICS Certified Supply Chain Professional (CSCP) program, you can take your career and organization in a new and exciting direction. In this challenging global marketplace, only the most well-trained, well-educated professionals will be sought after by employers and valued by organizations. "With the knowledge I gained from the APICS CSCP course, I was able to help Yokohama Tire realize about a 20% reduction in consumer inventory while still maintaining our high customer standards." Creating a common framework to address our company's unique supply chain challenges and opportunities. Aligning supply chain strategies with our business objectives. Improving performance through logistics, technology and data integration. Effectively managing supplier and customer relationships. Increasing customer satisfaction and bottom-line results. Companies that sponsor all or part of their employees' tuition will gain a return on investment in the form of improved profits, long-term loyalty and more productive employees. "The program has benefited LG Electronics management in increased supply chain knowledge and expertise and improved communication and information sharing across departments." The APICS CSCP program will give you more credibility and recognition in your workplace and worldwide. You can distinguish yourself by committing to continued education that will help you sharpen your skills. This program gives you the opportunity to master supply chain management and all its facets all on the cutting edge of new developments and concepts. This knowledge and expertise will make you more respected and valuable in your organization and in other businesses around the world. "Now that I have the background from the APICS CSCP Learning System, I am more comfortable dealing with day-to-day operations, coworkers and vendors. I can speak and understand the language my logistics suppliers use. By telling them I'm an APICS CSCP designee, they know I'm knowledgeable." 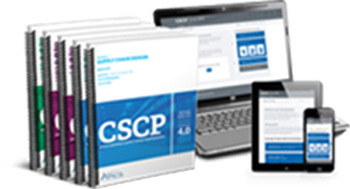 Register Today (HERE) and Move Your Career Forward with the APICS CSCP! Broad concepts of supply chain management, including primary processes, objectives, integration methods and benefits. Nick Testa has been in senior management for over 30 years, applying Supply Chain, Lean and other business improvement tools at and within organizations of all sizes and types. Also active in APICS, he served on its board and as President of this global Association for Operations Management. He is an internationally known speaker, college instructor, and consultant. He analyses real world problems with insight and pragmatism, helping students bring the lessons of the classroom back to work. Exams are administered on computers by a testing agency. Exam fees are not included in the course fees. A candidate must qualify to take the exam. To earn your APICS CSCP designation, you must pass one comprehensive exam. Prior to taking the exam, you must be eligible. Eligibility applications must be received two weeks prior to the day you register for computer-based testing (CBT) exams. Submitting your eligibility application is free and easy. Complete your eligibility application for the APICS CSCP exam now. You will receive notification of your eligibility status via email within two weeks of the date APICS received your application. The APICS CSCP exam is administered through an independent service provider and expert in providing knowledge measurement services. To learn about the process of registering for your APICS CSCP exam, visit the following link. The name listed on your APICS record (and therefore the name that is sent to the testing vendor) must exactly match your name as shown on your two forms of identification. If your name does not match your identification, you will not be able to access the test center and you will forfeit all exam fees. *If you did not pass your previous APICS CSCP exam, or your cancellation from your previous APICS CSCP exam was not approved, you qualify for the retake fee. Handouts of slides and supplemental material. NOTE: Materials will be picked up at the first class session. The learning system contains an on line portion. After payment and before the first session the student will receive on line access information and should activate their account and complete the on line Pre-Test. The test should be completed only once. The CSCP Certification course offers Supply Chain professionals the opportunity to earn advanded credentials and further solidify their value to their employeer.